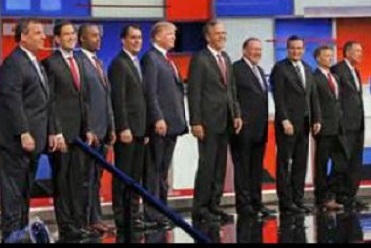 CLEVELAND, Ohio, August 7, 2015 (ENS) – Ten Republican presidential hopefuls lined up on the stage Thursday night for the first face-to-face debate of the 2016 election season. Environmental issues were not addressed, not even control of climate change, which many experts and other politicians have called the greatest challenge of of our lifetime. Positioned on the stage by how they stand in an average of five national polls, in the center of the stage was businessman Donald Trump. Then, in order of popularity: Former Florida Governor Jeb Bush; Wisconsin Governor Scott Walker; Former Arkansas Governor Mike Huckabee; neurosurgeon, Dr. Ben Carson; Texas Senator Ted Cruz; Florida Senator Marco Rubio; Kentucky Senator Rand Paul; New Jersey Governor Chris Christie; and Ohio Governor John Kasich. Only one of the three debate co-moderators, all Fox News personalities, mentioned the environment, and that came in a question to the candidates on shrinking the size of government, taken from a Facebook post. “Broadly, the size of government is a big concern for Facebook users, Facebook persons, as well as, obviously, conservatives,” said Baier. “But year after year, decade after decade, there are promises from Republicans to shrink government. But year after year, decade after decade, it doesn’t happen. In fact, it gets bigger, even under Republican politicians,” the moderator said. Huckabee did not address that part of the question concerning the U.S. Environmental Protection Agency, EPA, although Republican elected officials have often attempted to cut back the powers of the agency, arguing that it was overreaching. “And the fact is there are a lot of things happening at the federal level that are absolutely beyond the jurisdiction of the Constitution. This is power that should be shifted back to the states, whether it’s the EPA, there is no role at the federal level for the Department of Education,” said Huckabee. The debaters then took up the issues of taxation and the Internal Revenue Service and education. The environment was not mentioned again. Several hours earlier, during the so-called Happy Hour debate for the seven Republican candidates who did not make the Fox News cut for the Prime Time debate, Senator Lindsay Graham of South Carolina did address the issue of climate change. Graham replied as if he were the Republican nominee and Democratic candidate Hillary Clinton was the nominee of her party.